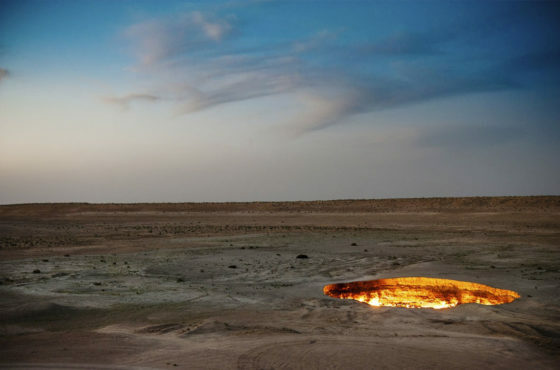 Fire crater diameter of 60 m is located in the middle of the Karakum desert. It was formed in 1971 after unsuccessful drilling of an exploration well in places where natural gas. To the gas does not hurt people, a crater burned in the hope that it will burn out in a few days. But he continues to burn, and now, after 46 years. Derweze (Persian: The Gate, also known as Darvaza) is a village in Turkmenistan of about 350 inhabitants, located in the middle of the Karakum Desert, about 260 km north from Ashgabat. In 1971, near the village of Derweze in Turkmenistan, Soviet geologists discovered a cluster of underground gas. As a result of excavation and drilling, geologists stumbled on an underground cavity (void), because of what the earth has failed, and formed a big hole filled with gas. Drilling rig with all the equipment and transport fell in the resulting hole, the people in this incident were not injured. To harmful to humans and livestock gases do not go out, they decided to burn. Geologists have suggested that the fire will go out after a few days, but we were wrong. Since 1971, the natural gas coming from the crater, continuously lit day and night.